With its latest trade tariffs, the United States has presented a number of both economic and political challenges not just for China, but also for countries that represent approximately 60 percent of the world's GDP. With Trump at the forefront of these tariffs, it's unclear how a trade war will achieve his dream of "Making America Great Again." The goal of the Trump administration is to eliminate or minimize all multilateral trade deals and organizations in favor of a spoke and hub system, which puts the U.S. at the center of favorable bilateral trade agreements with every country on earth. This is seen as the key to maintaining the type of American Exceptionalism, which he and others believe is the key to the world's future. The only things in his way are his neighbors, allies, competitors and a handful of multilateral organizations, but his biggest target is China, a rising power whose economic and political outlook and success are viewed as a direct challenge to the Pax Americana. Ninety percent of the U.S. tariffs targeted capital and intermediate goods, including refrigeration compressors, ball bearings, aircraft parts, batteries, electrical generators and equipment, industrial ovens and furnaces, train and rail parts and construction equipment. What do these things have in common? They are the machinery and parts used by American manufacturing companies. At this point, you may be scratching your head, why would Trump be imposing tariffs on things American companies need to create products, if he is trying to attack China? The answer is simple; he wants to decimate China's role in the global supply chain, by making Chinese goods less competitive. But by increasing the costs of necessary components from China, Trump is forcing American companies to pay more and thereby affecting their ability to compete with companies from other countries, who do not have to pay tariffs. It's important to remember the 1930 Smoot-Hawley Tariffs, which saw the world lose 66 percent of its international trade between 1929 and 1934. Known as the Great Depression, it resulted in tragic economic and social consequences for the people in the U.S. and around the world. Unfortunately, just like during the Great Depression, the economic and social costs of the recent trade war will be felt by American businesses and consumers. Businesses will pay the costs of changing their supply chains. Consumers will pay higher prices for goods caused both by tariffs in the short run, and the costs of economic disruption to businesses in the long run. Unfortunately, while the tariffs may also hurt China economically, they won't help the U.S. repatriate industries and jobs back to America. The same market pressures that saw U.S. companies move their production to China due to the lure of cheap land, construction costs and labor, will simply see any new manufacturing facilities move to other places, even cheaper than China. For example, in the U.S., labor costs are around $15 an hour for assembly work. In China, it's $15 for a day's wages, in other parts of Asia, it's $15 for a week's wages. 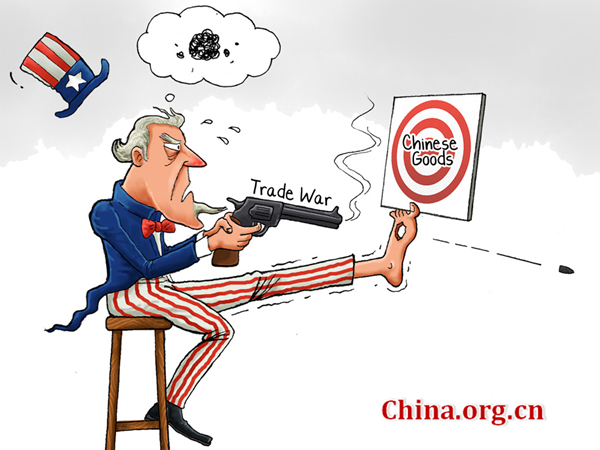 As such, it is apparent that the Trump administration's trade war is not about Making America Great Again by appealing to Americans to be better, smarter and harder working, but an attempt to make their neighbors, allies and competitors vassals to American economic and political desires, by destroying or subjugating their economies. Trump and his advisers believe that their trade war is the key to decimating China's economic and political role in the world and making other countries toe the line. They believe that success would allow the U.S. to force its economic and political will on all lesser powers, thereby extending U.S. politics, economics and hegemony. The problem is, attacking your neighbors, allies and competitors at the same time is not a winning formula and will encourage them to band together, not cower in fear. Further, forcing U.S. consumers and businesses to pay the cost of a trade war will in the end be a political deadfall, but it is not clear that Trump sees beyond his own ambition and ego. As Benjamin Franklin said, "We must, indeed, all hang together or, most assuredly, we shall all hang separately." If super powers around the world do not protect the economic and political mechanisms like the WTO and the UN, the world as we know it will dissolve, taking with it the achievements of the past 17 years. Countries, if they value their independence and prosperity, must put aside their differences and start recognizing what they value to develop a coordinated response to Trump, and if not, they should be prepared to "hang alone." The way forward offers a stark choice, either economic and political subjugation under an aging hegemony, or a multilateral economic and political system, which uses trade and political bodies to reach consensus.